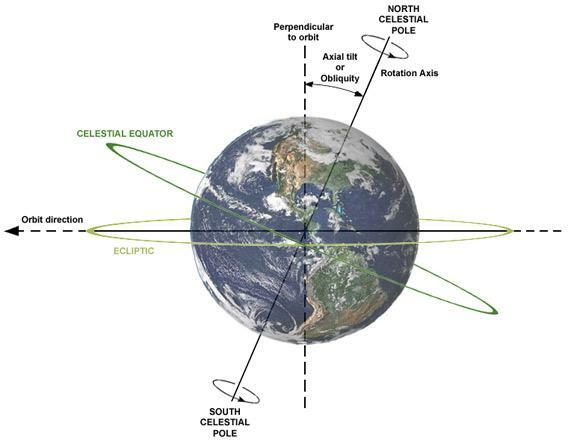 Winter solstice 2012: The axial tilt of the Earth is the real reason for the seasons. I’ve been saying that today’s date is meaningless when it comes to doomsdays, which is true. But it does have astronomical significance, and for Northern Hemisphereans it’s a happy one: Today, at 11:12 UTC (06:12 Eastern time) it was officially the winter solstice. That means the nights are getting shorter, the days longer, and that half of winter is behind us. There are a lot of different ways to describe this. One is to observe the Sun over the course of the year. In the summer it’s higher overhead at noon, and in the winter it’s lower. If you keep careful track of the arc the Sun makes in the sky every day, you’ll find it’s highest around June 21 every year, and lowest around Dec. 21. That’s a rough guide to the time of the solstices. Another way is to measure the position of the Sun against the background stars. Astronomers use a coordinate system for the sky that’s much like using latitude and longitude on the Earth, but (for historical reasons) we call them Right Ascension and declination. Just like latitude measures your position north or south of the Earth’s equator, declination measures a star’s position north or south of the celestial equator (which is really just the Earth’s equator projected on the sky). If you measure the Sun’s position on the sky, you’ll find that every year around June 21 it reaches its northernmost declination, and around Dec. 21 its southernmost. What astronomers define as the winter solstice is the exact moment the center of the Sun’s disk reaches its southernmost declination. Today, that was at 11:12 UTC. So what causes this? The Earth’s tilt! We orbit the Sun once per year in a path that is very close to a circle. The Earth also spins once per day, of course. The axis of that spin, though, is not exactly perpendicular to the plane of its orbit. Instead, it’s tilted by roughly 23 degrees. That’s why every school globe you’ve ever seen is tilted, in fact! The Earth’s tilt with respect to its orbit. As the Earth orbits the Sun, the axis stays pointed in one direction on the sky—the north pole more or less points toward the north star Polaris. So sometimes the Northern Hemisphere is tilted toward the Sun, sometimes away. When we’re tipped toward the Sun, the Sun gets higher in the sky, heating the ground more directly, warming us up. It also means the Sun stays up in the sky longer (days get longer) so there’s more time to warm up every day. It’s summer! Earth revolving around the Sun. Note the orientation of the Earth’s axis doesn’t change. The opposite is true in the winter: We’re tipped away from the Sun; the Sun is lower in the sky; it heats the ground less efficiently; and days are shorter. It gets cold: Welcome to winter. Today, the Northern Hemisphere was tipped as far away from the Sun as it gets: the winter solstice. But that’s a good thing! Every day for the next six months, we’ll slowly round the Sun and have our axis point more toward it. The Sun will get higher, the days longer and warmer. That’s why ancient civilizations celebrated the solstice. It meant the return of the Sun and warmer days ahead. While in the United States we tend to call this the first day of winter, I think it’s more like the halfway mark. After all, the past six weeks the Sun has been getting lower in the sky, and for the next six it gets higher. The solstice is the midway point between those two, so for me it makes more sense to call this midwinter’s day; the midpoint of winter. And I can’t help but mention this: The end-of-the-world crowd really screwed this one up. For ancient peoples this wasn’t a day for doom and gloom! It was generally a day to be happy, to celebrate. And I suppose it still is. We have a far greater understanding of astronomy now, and how the Earth interacts with the Universe around it. And we still get to enjoy the idea that warmer days are afoot. It’s the best of both—of all—worlds.